In its earliest guise, Jackaroo Island was capital of Jillaroo State in northwest Irukandji. When I decommissioned Jillaroo in late 2008, I kept Jackaroo Island and moved it north of Cabria Island in the far east of the estate. It sat largely unused for several months until finally, in early 2009, it was renamed Cabria Landing and sold off to another estate. Most people however, remember it as the central island of Jillaroo. The design and layout of Jackaroo Island was based on the much earlier and very successful Alantay Island. The uptake of land was quite healthy, and it would be the last simulator on which I was able to charge a purchase price for parcels. Jackaroo Island was well serviced by the Trans Irukandji Causeway, and a branch of the Odin River passed through it as well. 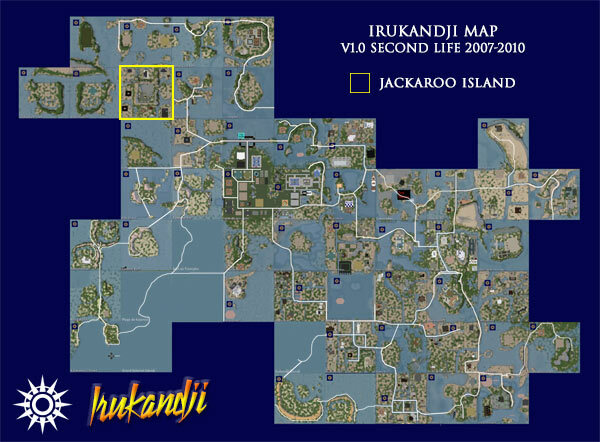 The island also had a local Irukandji Info Centre and a satellite branch of Irukandji Police. Neighbouring sims were Tuvalu Straits, Barramundi Bay, Captain Cook Reef, Tanawayo Bay, Coraki Lagoons, Mantaray Shoals, and Yeppoon Atolls. Regrettably, no photographs have yet surfaced of Jackaroo Island. If you happened to have visited there and took photos and wish to share them on this page, please let me know via the comment section below.